Widely owned and used by families and enterprises, iPad is the No. 1 tablet all over the world. Users store really important data, such as photos, notes, videos, etc. in their iPad. The more important the data is, the more anxious you will be when you lose them. iPad data recovery software is designed to help iPad users to recover deleted/lost data from iPad, iTunes backup file and iCloud backup file. There are millions of ways you lost your iPad data, mistaken operation, updating error, jailbreak, etc. But there is only one way to recover iPad data – iPad Data Recovery. It can recover photos, videos, notes, iMessages/text messages, voice memos, contacts, calendars, reminders, safari bookmarks. How to Recover Data from iPad? Download, install and run iPad Data Recovery on your computer with iTunes installed. Connect your iPad to your computer via USB cable. The software will automatically detect your iPad. If the iTunes pops up, please close it. For iPad 1 users, you need to enter the scanning mode manually following the little guide on the interface of iPad data recovery. There are two modes, standard mode and advanced mode. We recommend you to choose the advanced mode. This mode can find more lost/deleted data from your iPad. 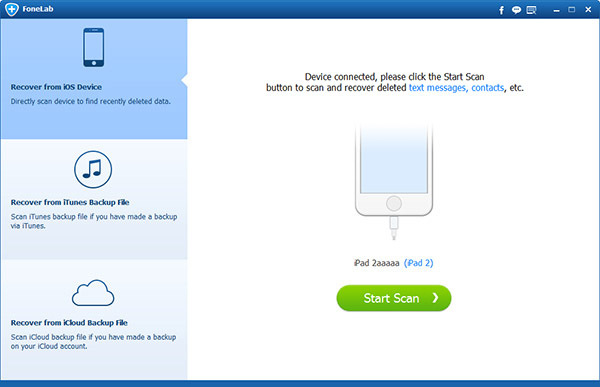 For users of iPad 2 and other generation, click “Scan” button to begin the scanning to find your lost/deleted data from your iPad. All the data from your iPad including both deleted and existing data will be display on the interface of the software classified by types after scanning. You can easily find the data you want to recover and check the box before its file name. When you find all the data you want to recover, click “Recover” button to recover iPad data easily. Soon you will get all the data on your computer. How to Recover iPad Data from iTunes Backup Files? If your iPad was stolen or you didn’t find your lost/deleted data from iPad device, you can try to recover iPad data from iTunes backup files. Actually, every time you sync your iPad with iTunes, your iTunes will make a backup file for your iPad. So you can recover data from it by iPad data recovery. Download, install and run the recovery software on the computer which your iTunes installed. Select the second option from the left menu of the main interface. You can see all the iTunes backup files for your iPad and other iOS devices on this computer. Select the latest backup file of your iPad and then click “Scan” button. The software will begin to scan your iTunes backup file. 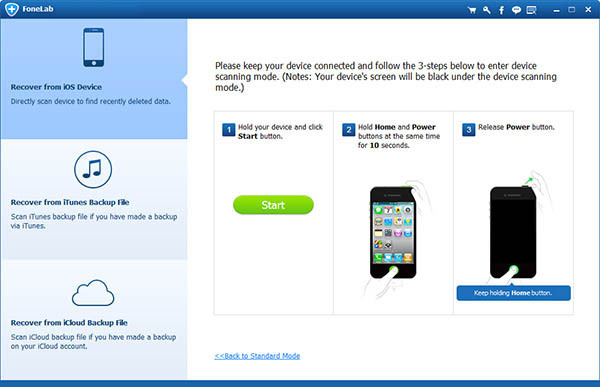 Once the iPad data recovery software finishes the scanning, you will see all the data listed on the interface. You can easily find the data you want to recover and preview the photos, notes, iMessages, videos, contacts, etc. before you recover them. Find all the data you want to recover and click “Recover” button, the software will begin the recovering process. You can recover deleted data from iPad to computer as soon as possible. How to Recover lost/deleted Data from iPad iCloud backup files? If you have enabled the iCloud service and made iCloud backup file for iPad, you can recover iPad data from iCloud backup files with iPad Data Recovery. 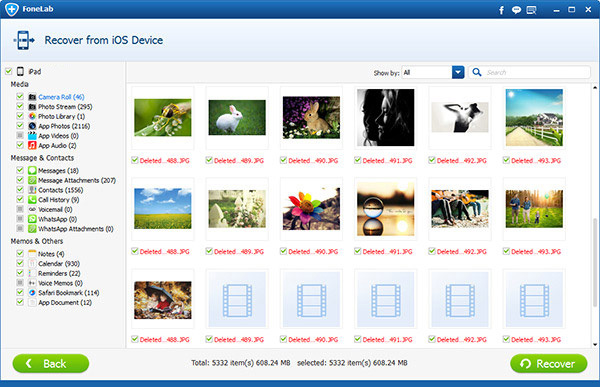 Launch the iPad data recovery software and choose “Recover Data from iCloud Backup files”. You will need to log in to your iCloud account. Then you will see all the iCloud backup files in your iCloud account. Select the latest one to download and scan. 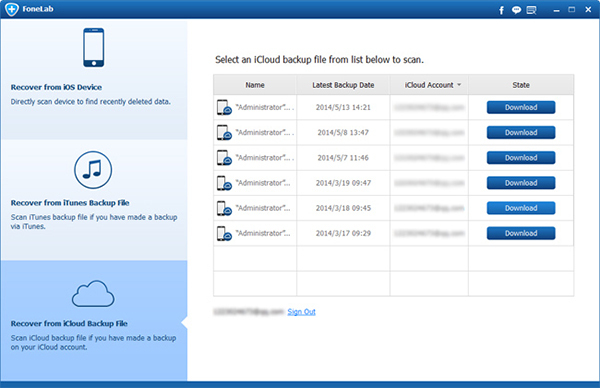 The software will list all the data it found from your iCloud backup file. You can check them by entering each group from the main interface. Remember the check the box before the file’s name if you want to recover it. 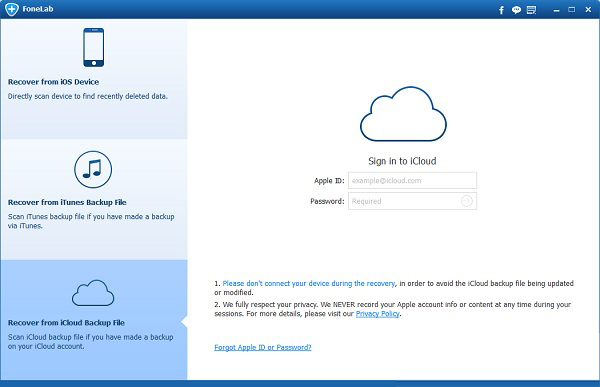 Check all the data you want to recover and click “Recover” button to recover data from iPad iCloud backup file easily. That’s all for recovering data from iPad. If you lost your data from iPad, iPad data recovery will help you to recover your deleted/lost data from your iPad, iTunes backup file and iCloud backup files easily. 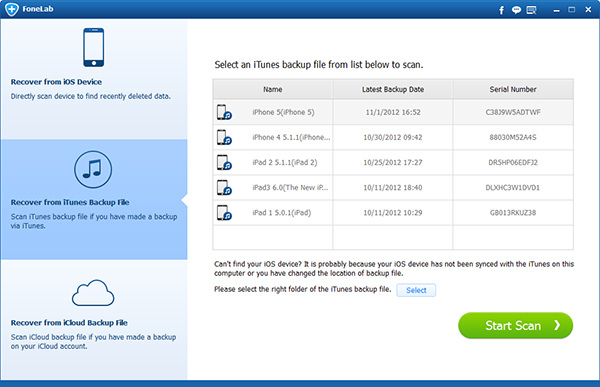 To make your data safe, we recommend you backup your iPad data with iTunes/iCloud regularly.